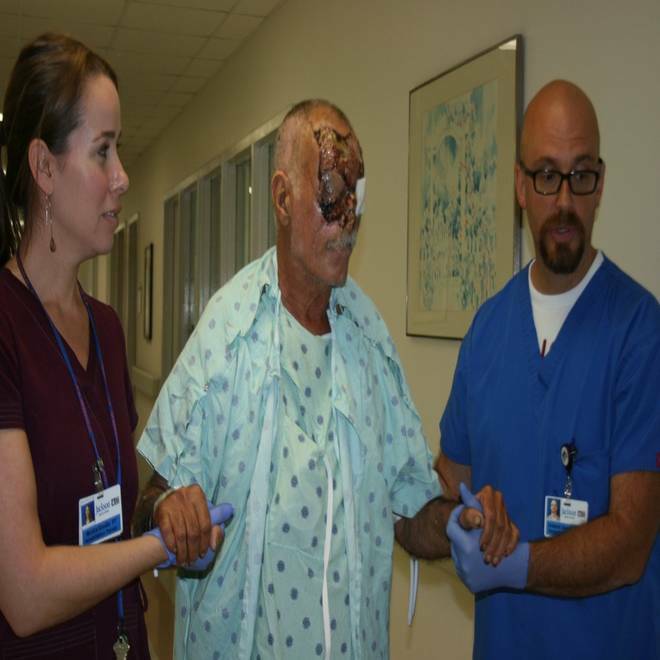 In this handout image provided by Jackson Memorial Hospital, cannibal attack victim Ronald Poppo, 65, shows the extent of his injuries while still in the hospital on June 12, 2012, in Miami, Florida. The 65-year-old homeless man whose face was viciously chewed off by a naked man in Florida can be heard speaking for the first time since he was assaulted by the so-called “Miami Zombie” in May. Doctors say Poppo lost nearly 80 percent of his face, including his nose, was blinded in the attack and also was inadvertently shot by police in the chest. After several surgeries at Jackson Memorial Hospital in Miami, Poppo was transferred to Purdue Medical Center, a long-term care facility also in Miami. A fund set up to help cover Poppo’s health care costs raised more than $100,000. He is now awake and alert. The attack happened the afternoon of May 26 when Eugene, not wearing any clothes, approached Poppo near the highway. That’s when police say Eugene started chewing off Poppo’s face and only stopped when officers shot and killed him. The 18-minute attack was captured by a security camera on the building that houses the Miami Herald. This undated booking file photo made available by the Miami-Dade Police Dept. shows Ronald Poppo before he was attacked. Poppo’s statements were recorded during a July 19 interview with Miami homicide Det. Sgt. Altarr Williams and Det. Frankie Sanchez. Sgt. Williams asked Poppo what Eugene was saying when he attacked him. A man was shot to death in Miami after eating the face of his still-living victim. WTVJ-TV's Diana Gonzalez reports. An autopsy of Eugene revealed no human flesh in his stomach but a number of unidentified undigested pills were present. Although police had initially speculated that the street drug “bath salts” may have been involved, preliminary toxicology reports were positive only for marijuana. 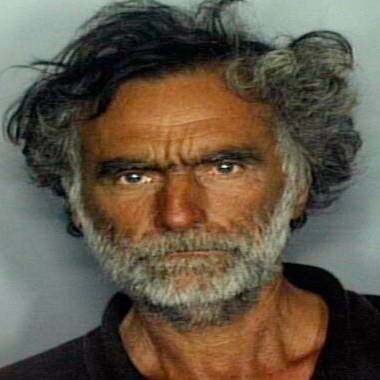 Both the cause and motive for Eugene’s bizarre behavior remain unknown. Poppo said Eugene did not have any type of weapon. He also said he did not recall ever meeting or seeing Eugene before the day of the attack. The police investigation revealed that Eugene had an extensive criminal history, having been arrested eight times since the age of 16.